Dustin Johnson looked set for a big lead at the Saudi International on Saturday – but Haotong Li had other ideas. Johnson still led by as many as four shots with a couple of holes to play before Li picked up four shots over his last two holes thanks to a pair of eagles on 17 and 18. 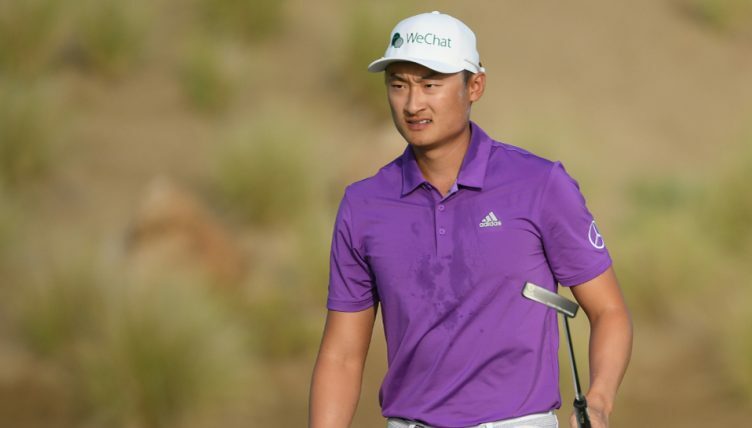 Incredibly, Li had already made two eagles earlier in his round, so he finished the day with four on his card – the first man to do so in 20 years – ultimately signing for a spectacular eight-under-par 62 to join Johnson on 16 under par. Three of Li’s eagles were made on the par-4s thanks to his prodigious length off the tee. The 23-year-old from Hunan province started his round with an eagle at the par-4 first hole before adding another birdie at the fourth. He undid much of his good work with a double-bogey at the sixth but there was a lot more to come. Li bounced back immediately with another birdie at seven and them came that incredible back nine – another eagle-two at the 10th, followed by six pars and two further eagles at the par-4 17th and par-5 18th. Johnson, meanwhile, was one under for his round through the first eight holes after following up birdies at the second and fourth with his only bogey of the day at the fifth. But he really made his move from the ninth, making four straight birdies to sign for a five-under-par 65 that looked certain to hand him a big advantage at the top of the leaderboard, only for it to be erased in no time flat by Li’s incredible eagle heroics. Sunday’s final round, then, looks set to be a straight shoot-out for the title between Johnson and Li, who are five shots clear at the top. England’s Tom Lewis lies in third on 11 under after a hugely impressive eight-birdie 62 of his own on Saturday. He is a further two shots clear of Australian Ryan Fox and Frenchman Alexander Levy, who despite being tied for fourth are a full seven shots behind the frontrunners. Elsewhere, there was drama for Sergio Garcia, who was disqualified from the tournament after admitting to damaging several greens in frustration during the round. He was disqualified under Rule 1.2a for committing a serious breach of the Rules of Golf. Dubai champion Bryson DeChambeau shot a third successive 68 to finish on six under, one shot behind Ian Poulter, who also shot a 68. World No 2 Brooks Koepka shot a disappointing 74 to lie 61st out of 65 players on three over.